Jiji Skariah, the CEO of Global Aid Network Australia (GAiN), knows about humanitarian aid trips. As the leader of the medical mission team that recently travelled to Legazpi, Philippines, he was able to give clear instructions to the group about what to bring and how much. This time, there were 20 on the team. Like Jesus’ disciples who travelled light (Jesus told them not to even take a change of clothes! ), their focus was on ministry and depending on God’s provision, not personal comfort. 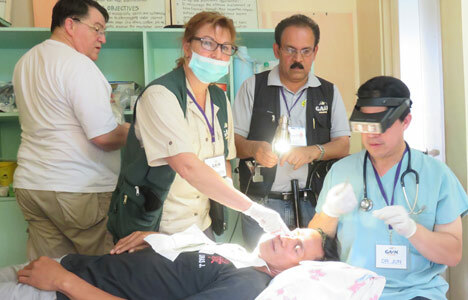 The team helped out 1,673 people with illnesses ranging from ear infections to tuberculosis. They also performed numerous surgeries. If you’re into teeth, the dental team saw 247 patients with an average extraction rate of 3 teeth per patient. A Medical Team without a Doctor? Two Australian doctors were unable to attend part of the clinic days during the trip. The GAiN team prayed, but there were no replacements when they arrived in Legazpi. At the hotel, an Australian doctor who was attending a school reunion happened to be at the reception desk when the team arrived. She agreed to change her plans and volunteer the help at the clinic on those days. Furthermore, two Legazpi-based medical practitioners and 2 dentists from Manila also joined the team. God’s provision is amazing! One night while the team was out in the city, some of them chatted with a group of locals. They turned out to be medical students. Three of them decided to join the mission for hands-on training with an “expert from Australia”. This encounter led to a meeting with the director of the local hospital who expressed an interest in partnering with GAiN for future medical missions trips. The team shared the Gospel with the Muslim student doctor and he accepted Christ. He was elated shared his testimony at the mission farewell dinner. One woman became very curious about the change she saw in her colleague, and after further conversations, she also made a decision to trust Jesus. Over the course of 8 days in 8 villages, 747 people heard the Good News of Jesus Christ and made concrete faith decisions. The next GAiN Australia medical missions trip will be to India from 29 August to 10 September 2016. COMMENT AND SHARING FUNCTIONS ARE NOW AVAILABLE FOR ALL STORIES. FEEL FREE TO GIVE YOUR FEEDBACK. WE'D LOVE TO HEAR FROM YOU!